Leah Hogsten | The Salt Lake Tribune Sen. Mike Lee, who is a former federal prosecutor and Supreme Court clerk, fields questions about the possibility of Lee filling the Supreme Court vacancy from members of the media after speaking about Utah's public lands at a forum hosted by the Sutherland Institute, June 29, 2018. For a small state, Utah has an outsized role to play in filling the current vacancy on the Supreme Court of the United States. Let’s hope it turns out to be a performance we can be proud of. Senior Sen. Orrin Hatch, as a long-time member of the Judiciary Committee, will of course be consulted before the White House announces its choice to fill the seat of retiring Justice Anthony Kennedy. And he will be a key player in the subsequent confirmation hearings. 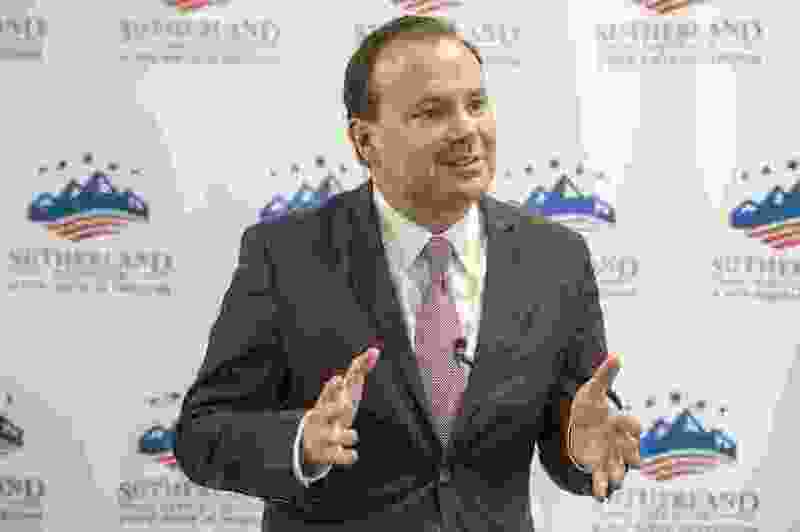 Junior Sen. Mike Lee is not only a member of that same committee, but he is on the short list the president has been waving since before he was elected as suitable candidates for the high court. Lee has been in touch with the White House on the matter, though he has, judiciously, declined to disclose whether it is in his role as a candidate or as a senator. And his brother, Thomas Lee, a member of the Utah Supreme Court, is also on that list. Elections have consequences, and the party that controls the White House and the Senate has, through the democratic process, won the right to fill the vacancy. But that doesn’t mean anybody needs to be a jerk about it. A little Utah calm and comity would be very useful in this process. There is no doubt that any justice selected by this administration, and confirmed by this Senate, will be a conservative Republican. But even that tent includes a great many people with a wide array of skills, talents and experiences. The politics of the moment are highly polarized, even by the recent standards of the culture wars, the tea party and the last election. It would be a wonderful tonic for the body politic if the coming confirmation process were an exception to that rule. Surely, Utah’s legal experts could lead a process in which all efforts are made to find and approve a new justice who pleases the Republicans who hold the majority, but who can make a credible case to the Democrats, as well as to the nation, that he or she is a reasonable, thoughtful and well-read jurist. Someone who may lean to the right but also respect the views of others, especially other members of the court, in seeking consensus rulings in as many cases as possible and resisting any urge to sweep aside standing precedents just because he can. This would not only benefit the court and the nation. It could even be a good thing for the Republican Party. The Democrats already feel as though they have a quiver full of emotional issues, issues that break their way, to take to the voters in November. A highly stressful Supreme Court confirmation process could feed those flames even more. So, for the good of all, the message right now might be to find a nominee who is as close as possible to a consensus candidate. Is too much to expect, perhaps. But it’s not too much to ask.